Schuhmacher Trachten necklace with edelweiss motif. Whether elegant, playful, or chic, Trachten accessories should always match the outfit and the occasion. 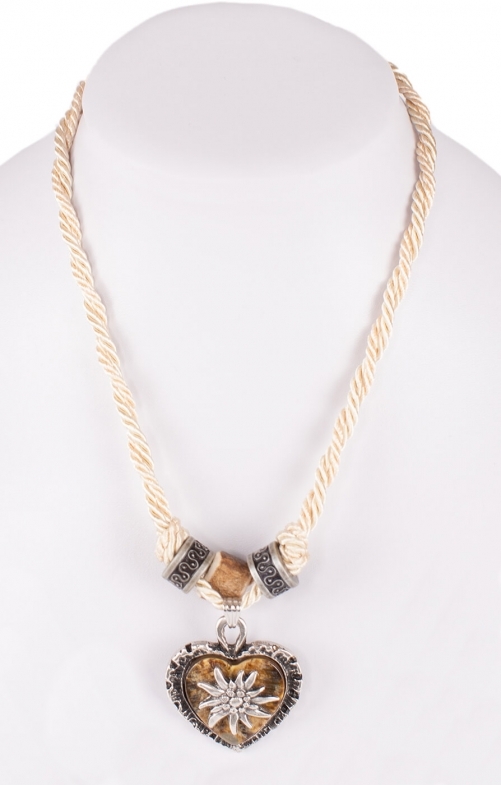 With a twisted cord band and a respectable edelweiss motif, this Trachten necklace by Schuhmacher plumps for tradition. The large heart pendant is made from metal and finished with an old-silver look. A marbled stone sits at its centre and is surrounded by an engraved edelweiss motif, lending the necklace a fierce, yet delicate look. The cord separates at the middle and is fitted with three further pendants. Two of these are adorned with Trachten decorations, while the third pendant takes a classic horn shape. This necklace can be closed with a lobster clasp and adjusted by length as you wish. Produkt wie in Beschreibung sieht sehr gut als. Gutes Preis/Leistungsverhältnis.